Is there a new future for microgrid installations on the island? PUERTO RICO - The Puerto Rico Energy Commission unveiled 29 pages of proposed regulations last week for future microgrid installations on the island. The regulations, which are now open for 30 days of public comment, synthesized pages of responses received after a November 10 call for recommendations. Commission chair José Román Morales said it’s the most interest the not-yet four-year-old commission has received during a public rulemaking process. The goal was to sketch a clearer outline for a tricky-to-define concept -- the term "microgrid" can refer to many types of generation islanded from the central grid -- as more developers eye installations on the recovering island. “There’s not a standard definition of what a microgrid is, not even on the mainland,” said Román Morales. According to the commission's regulation, “a microgrid shall consist, at a minimum, of generation assets, loads and distribution infrastructure. Microgrids shall include sufficient generation, storage assets and advanced distribution technologies to serve load under normal operating and usage conditions. All microgrids must be renewable (with at least 75 percent of power from clean energy), combined heat and power (CHP) or hybrid CHP-and-renewable systems. The regulation applies to microgrids controlled and owned by individuals, customer cooperatives, nonprofit and for-profit companies, and cities, but not those owned by the Puerto Rico Electric Power Authority (PREPA). Owners must submit a registration application for approval, including a certification of inspection from a licensed electric engineer, and an annual fuel, generation and sales report that details generation and fuel source, as well as any change in the number of customers served. Microgrids can interconnect with the PREPA system, but if a microgrid will use PREPA infrastructure, owners will incur a monthly fee. That amounts to $25 per customer up to a cap of $250 per month for small cooperative microgrids. The cost for larger systems is calculated using a separate, more complex equation. Operators can also sell excess energy back to PREPA. In total, 53 groups and companies, including Sunnova, AES, the Puerto Rico Solar Energy Industries Association (PR-SEIA), the Advanced Energy Management Alliance (AEMA), and the New York Smart Grid Consortium, submitted their thoughts about microgrids or, in many cases, broader goals for the island’s future energy system. It was a quick turnaround: The Puerto Rico Energy Commission offered a window of just 10 days to submit advice, although the commission continued to accept comments after the deadline. “PREC wanted the input as fast as possible because of the urgency,” said AES CEO Chris Shelton. AES’ plan includes a network of “mini-grids” that could range in size from several megawatts to one large enough to service the entire city of San Juan. According to estimates provided in AES’ filing, utility-scale solar installations over 50 megawatts on the island could cost between $40 and $50 per megawatt-hour. Those prices make solar located near load centers an economic alternative to the island’s fossil-fuel generating plants. The utility’s analysis showed that a 10,000-megawatt solar system could replace 12,000 gigawatt-hours of fossil generation, with 25 gigawatt-hours of battery storage leveling out load throughout the day. Puerto Rico’s peak load is 3,000 megawatts. In other filings, PR-SEIA urged a restructuring of FEMA funds so they’re available for microgrid development. GridWise Alliance wrote that plans should consider cybersecurity, and AEMA recommended the commission develop an integrated resource plan (IRP) that includes distributed energy resources, microgrids and non-wires alternatives. After the commission completes the microgrid rulemaking, a new IRP is next on the commission’s to-do list. PREPA must file that plan in July, and regulators are working furiously to make sure it incorporates the recent flood of rebuilding recommendations from the energy industry. Though the commission has the final say when it comes to approval of the plan, PREPA will lead the IRP process. The utility’s newly formed Transformation Advisory Council (TAC), a group of 11 energy experts, will contribute. With that group, along with New York’s Resiliency Working Group, the Energy Commission, the utility itself, and the dozens of other clean energy experts and entrepreneurs who want to offer their two cents, the energy planning process has a lot of moving parts. 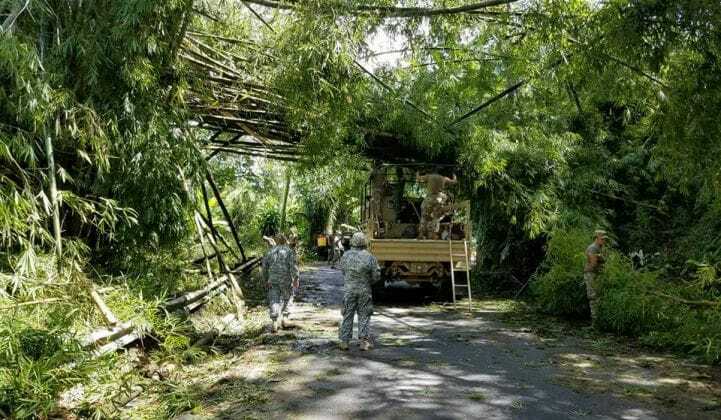 But according to Julia Hamm, CEO of the Smart Electric Power Alliance and a member of both the Energy Resiliency Working Group and the TAC, those working to establish standards for Puerto Rico’s future are hitting their stride. Nisha Desai, a PREPA board member who is liaising with the TAC, affirmed that collaborators are on the same page. “Everyone is violently in agreement that the future of Puerto Rico involves renewables, microgrids and distributed generation,” she said. The TAC will hold its first in-person meeting in mid-January, and has already consulted with the utility on its formal fiscal plan submission, due January 10. Puerto Rico’s current generation sits at just 72.6 percent. The government recently offered its first estimate that about half the island, 1.5 million residents, remains without power. In late December and into January, 1,500 more crewmembers from 18 utilities in states as far flung as Minnesota, Missouri and Arizona will land on the island to aid further restoration through mutual aid agreements.